EMV changes, security concerns, and technology enhancements have raised the stakes for competition amongst retail fueling brands. Oil Companies and merchants are doubling down on loyalty programs as a way to gain a competitive brand advantage and to learn more valuable margin-increasing behavior about consumers. In Nielsen’s Global Loyalty-Sentiment Survey, 72% of respondents said they would buy from a retailer with a loyalty program over one without. Retailers are no longer debating the efficacy of loyalty programs, but rather which program is best for their brand. But when it comes to strategy, many retailers are missing the mark. There’s a significant gap between the number of loyalty programs consumers enroll in compared to the number in which they are active participants. And that gap has widened in the past four years. 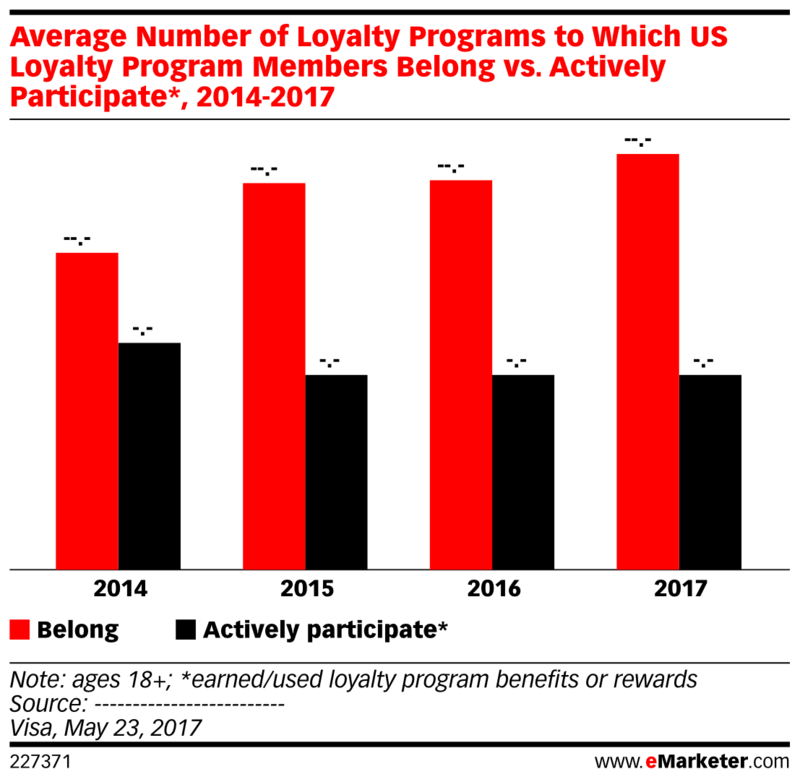 Fewer and fewer customers enrolled in loyalty programs are active in them, according to eMarketer. While consumers prefer to make a purchase from a gas station with a loyalty program, simply having a loyalty program doesn’t guarantee increased visits or spend. In order to be successful, loyalty has to be personalized. The access to mobile behavioral data allows retailers to provide more relevant, timely offers than ever before. But many aren’t taking advantage of this digital opportunity. In fact, “only a quarter of loyalty members said they are happy with the level of personalization experience,” in loyalty programs, according to eMarketer. Consumers want a personalized experience with their loyalty programs that they aren’t getting. But what can you do to provide that experience? Most retailers have access to a wealth of data that goes underutilized. Learn more about who your customers are and what they want by maximizing the use of this data. Using location and demographic information and purchase behavior to divide your audience into segments allows for smarter, more personalized offers. Many large retailers like Starbucks send digital offers tied directly to an individual's purchase history. A customer who orders a sausage biscuit one day might be targeted with an offer for a spinach wrap the next, expanding product trial and encouraging return visits. But personalization goes beyond catering to a consumer’s preferences. Retailers that use P97’s PetroZone mobile commerce and digital marketing platform have the ability to influence consumer behavior through audience targeting. Using purchase history, a brand is able to target a segment of consumers that typically purchases a competitor’s brand. A simple discount has the power to sway behavior for some consumers, often beyond that initial one-time purchase. The personalized approach is not only more likely to influence consumer behavior, but can deepen your relationship with your customer and encourage engagement. When used effectively, data-based offers are mutually beneficial. There’s an important distinction between the use of digital offers and electronic coupons, or e-coupons. Digital offers are targeted to a segment of users in a native mobile platform and can be updated from a promotional campaign at any time. E-coupons, in contrast, are digitized barcode coupons with a set expiration date that are blanketed to ALL consumers, which no discernment of audience or segments. Companies have limited, if any, control over who redeems an e-coupon, which often leads to cannibalized sales. What good is a discounted soda if a customer already planned to purchase that soda? While an e-coupon campaign might result in high redemption rates, those numbers don’t account for the lost revenue from customers who were already planning to purchase the item. This blanket discounting can be remedied with targeted digital offer campaigns that can be delivered to a specific segment and edited as needed, even during the campaign. Digital offers are distributed in a native mobile application so only the intended user may redeem it. The flexibility a true digital promotion allows marketers to respond to activity and make adjustments on the fly accordingly. Rather than emailing a coupon for 50 cents off a coffee to all of your customers, use behavioral data to distribute smart digital offers. Deliver a fuel discount to consumers who always visit the c-store without fueling up, or a food item discount to consumers who always fuel up without coming inside. Does your quick-serve food service need some love? Distribute an offer to users who typically visit during lunch time. Aim for campaigns that make offers timely and personal. You’ve created a digital offer targeted at a segment that’s sure to please your customers and increase sales. But the experience that your customer undergoes redeeming that offer will determine whether or not they will continue to participate in the program. There are countless obstacles that can disrupt the purchase process, and it doesn’t take much for a customer to abandon the campaign, or even the entire program, due to a difficult experience. A broken forgotten password link, a page that isn’t mobile optimized, or too many form fields in an order form can cause your customer to become frustrated without making a purchase. A seamless experience means there’s little to no friction your customers encounter to complete the purchase. This is one factor, but an experience can always be improved by technology, taking that experience from seamless to superior. A mobile app can be what takes that experience to the next level. A native mobile app results in less load time and easier navigation than a mobile website. An app also allows for integrated location services, mobile payments, and order ahead capabilities. PetroZone enables mobile payments at the pump and in store, while allowing consumers to receive digital, targeted offers, and order ahead at quick-serve restaurants. Marketers have full control over targeted digital offers that can be delivered locally or on a large scale. Customers can receive a digital offer for a discounted meal, order, and pay for that lunch from their phone, all before they’re finished fueling up. That’s an experience worth revisiting. “Mobile payment platforms will increasingly provide an opportunity for loyalty-program engagement with consumers, providing a convenient and personalized way for program members and retailers to engage with one another all along the path to purchase,” Louise Keely, executive vice president, Nielsen Global Retail Practice said. Using data to create digital offers and technology to build a superior customer experience will form the foundation for an exceptional loyalty program. Creating personalized offers will enable you to influence your customers’ behavior and build a relationship, setting you apart from your competitors and keeping your customers coming back.